After successfully completing Wittenberg, Cornell, and Slide, I wanted to do something with less climbing and with some off-trail exploration. 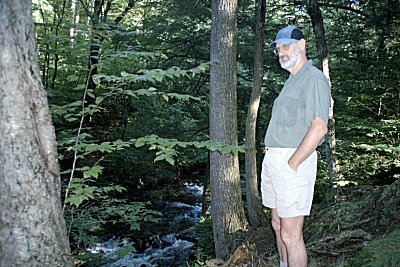 I had been hiking up Biscuit Brook perhaps 20 years ago, with Ben and Carrie (ages 8 and 6) and with two dogs. I had remembered the trail as relatively easy hiking, mostly in the canyon bottom. I also remember looking for, and failing to find, either the lean-to or Big Indian Mountain. This time we arrived at the trailhead just as darkness was falling. I had intended to get away earlier, but everything went more slowly than it should have. So we got out our flashlights and started up the trail. The weather was clear, after four straight days of heavy rain. In contrast to our earlier experience, there was water everywhere  the trail was muddy in many spots, and there were many places where water was running down the trail itself. It took all our concentration to follow the trail markers in the first mile  there was little sign of the trail on the ground itself. My headlamp proved to be very powerful; not having to hold it in my hands was even better. After we got to the ridge the trail leveled out and got much wider and easier to follow. It was still eerie, hiking along without being able to see anything but the ground ahead. We were relieved to finally come upon the lean-to, after two hours. No one else was there. It only took a few minutes for us to lay out our bags and get to sleep. Nearby Biscuit Brook provided a steady roar. My headlamp batteries conked out a few minutes after we arrived  great timing I guess. The next morning we stashed our packs nearby and went up the trail with only daypacks. It is so much easier that way ! One creek crossing proved to be challenging, but we both got across without getting wet. Hiking up the creek was pleasant, and almost before we knew it we were on the ridge leading to Big Indian. I had faint glimmers of recognition from years back, but the vista I remember never appeared. 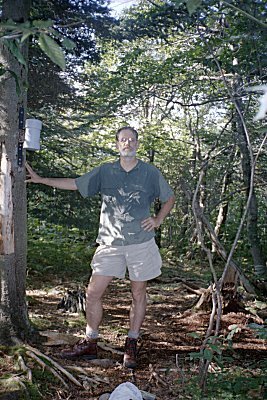 We saw the trail junction at the ridge top, but could not tell if it went to Seeger or to Doubletop. A little farther along we came to the 3500 foot sign and, just like the guidebook says, a path to Big Indian. The path was so well established that the only real difference was the absence of trail markers. A few minutes later we arrived at our first canister. The last name in the register was from several days prior. Only ten or twelve pages covered the whole summer season. I had expected many more names. I saw one name I recognized from work, and a number of others that I knew from the Yahoo 3500 club message board. After signing in and having a snack, we headed on toward Eagle Mountain. The route to Eagle is also relatively easy hiking. We saw many striking bushes with bright red berries along the way. At the apparent location of Eagle Mountain a side trail branches off, and goes a few feet higher, through a beautiful clearing, and down the other side. I was unsure whether there was a canister, but we looked all around. I had marked the high point on the map with my GPS, and it corresponded nicely with the side trail and the actual high point in the terrain, but no canister. I only found out later that there is none, because the trail is considered to cross the summit. That is not exactly the case, but next time I will read the club peak guide more closely. We returned to the lean-to, pretty tired after hiking 10 miles. We found a couple of packs there. The people showed up a little later, returning from climbing Fir Mountain. A brother-sister pair, they were friendly but a severe menace with their brand new MSR stove. 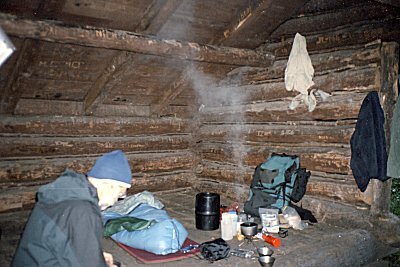 They pumped it up about 100 times and then opened it up and let gas spill all over the stove, the lean-to floor, and some of their gear. I suggested they move the stove outside, which they did, but then they needed help where to light it. Even though we got our stove out after they had started, we cooked and ate our dinner and were putting things away before they got their water boiling. I decided it would be better to move do a nearby clearing when the other people started gathering wood for a fire. They eventually got something going, although it was very smoky owing to the general dampness of everything. We came over and chatted by the fire for a little while, but went off to bed as soon as it began to get dark. We had to get an early start to have any chance at all of getting up Fir and home at a reasonable hour. Roy and I have had enough hiking experience together that we got up, got breakfast, and were packed and ready to go in less than an hour. We passed by the other hikers, asleep in the lean-to. The route up Fir was a straight line, up the ridge. I gave Roy a compass and let him lead the way. I checked up with the GPS from time to time, which was really unnecessary, as we were staying on course pretty well. There was little or no sign of a path most of the way up, even intermittently. We crossed fairly open forest floor, with lots of bushes, saplings, and down trees to maneuver around. But there were few really dense barriers or thorny patches. As we approached within 1/3 mile of the top, I found an intermittent path, which got more and more distinct as we followed it. It led right to the canister. Most of the same people signed in as at Big Indian. It appeared that some of them had come directly from Big Indian. I would be interested in trying that someday. As we descended, Roy and I drifted farther apart. I tried to keep him in sight, but suddenly he disappeared, and I could not hear him either. I tried to veer over his way, in hopes of regaining contact, but still could not hear or see him. I stopped and called, zigzagged back and forth for a while, but never did find him. I eventually figured he would find his way down, so I resumed my descent, looking and listening carefully the whole way. When I got back down, he was not there, so I sat down to wait. Within about two minutes he came walking up. Apparently he had done the same  looked for me, called, and finally descended. Its a good thing we both came down instead of waiting, for I would have hated to have to go back up. Maybe a pair of rhinos would be a good thing. As we rejoined the trail we came across the lean-to neighbors again, just getting started on the trail after sleeping in late. They were headed to Doubletop, via the ridge from Big Indian. The descent was pleasant, and a very different experience from the night we had come in. Needless to say we hardly had to glance up to the trail markers, the route was so distinct. At the trail register, we noted that half a dozen parties had entered since our own entry, even though we only saw one of those parties.